This is the winner of the Blue Peter Book Award and the Waterstones Children’s Book Prize, and shortlisted for the CILIP Carnegie Medal. 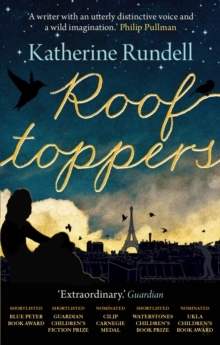 Already being proclaimed a classic in children’s literature and compared to the likes of Roald Dahl and Eva Ibbotson, Katherine Rundell’s Rooftoppers merges fantasy and historical fiction with sophisticated lyrical prose and vivid imagery that will delight middle grade readers, tweens, teens, and parents and teachers alike. Join plucky heroine Sophie, her eccentric guardian Charles, and her intrepid orphan allies on the rooftops of Victorian Paris, as they encounter suspense and adventure that will keep kids of all ages on the edge of their seats right to the heartwarming end. My mother is still alive, and she is going to come for me one day. Everyone thinks that Sophie is an orphan. Found floating in a cello case and swaddled in a Beethoven score, she is the only recorded female survivor of a shipwreck on the English Channel. But Sophie remembers seeing her mother wave for help…Charles, a fellow survivor and an eccentric scholar, finds Sophie and brings her home to his London bachelor flat. Raised in a quirky home filled with music, words and love (though questionable diet), Sophie grows into a free-spirited tomboy with a taste for Shakespeare and the unshakeable belief that anything is possible. And you should never ignore a possible. So when the child welfare agency in its bureaucratic wisdom threatens to send Sophie to an orphanage, the optimistic girl and her odd guardian flee to Paris on a quest to find her mother, starting with the only clue she has – the address of the cello maker. Secured in an attic to evade the French authorities, Sophie escapes through the skylight and meets Matteo and his network of rooftoppers – homeless urchins who tightrope walk above the busy streets below, dining on pigeons and snails alongside the gargoyles and bell tower of Notre Dame. Together they set out on an unimaginable adventure, scouring the city for Sophie’s mother before she is caught and sent back to London – and most importantly, before she loses hope.